Lea M. Del Rosso, D.V.M. Dr. Del Rosso came to Balboa Pet Hospital in June 1995 after earning her Doctorate in Veterinary Medicine from Oklahoma State University. 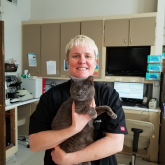 She has been serving the pets and clients here for over fifteen years as a general practitioner with special interest and expertise in internal medicine. A native Californian, Dr. Del Rosso was born in San Francisco and grew up on the peninsula in nearby Burlingame, the same area where she lives today. She earned her undergraduate degree in Biology from the University of California at Davis. 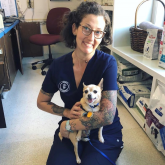 Dr. Del Rosso is on the Board of Advisors for the SF Aid for Animals, an all-volunteer organization whose mission is to make urgent life-saving veterinary care affordable. 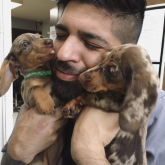 The organization provides local veterinarians with grants, enabling Bay Area residents to be able to provide affordable medical care to their pets. She and her husband are kept busy with a son who loves to swim, ski, and play baseball. They share their home with a beautiful cat named 'Mango' and a Spinone Italiano dog named 'Vita'. When she's not working, Dr. Del Rosso enjoys gardening and cooking and spending time with her family. During baseball season, she can often be found taking in a San Francisco Giants game soon! Dr. Mirzaeian was born and raised in Mashhad, Iran. 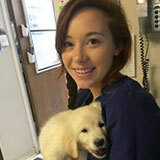 After graduating from the Veterinary School of Shiraz University with her DVM degree in 2012, she moved to the United States to continue her education. 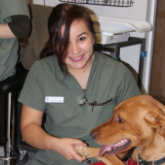 Completing a Master’s degree in Canine Life Science, she learned more about dog behavioral modification and training focusing on service dogs. 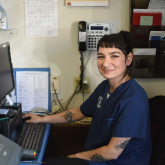 Before getting her DVM license in US and joining Balboa Pet Hospital, she spent time training dogs, working as a veterinary nurse and volunteering at various animal shelters. She continues to volunteer as a surgeon in bay area shelters. Her special interests include internal medicine, surgery and exotic animals. In her free time, Salumeh enjoys spending time with her husband and their corgi, canary, and clown fish: Chelsea, Ginger, and Jazz. She also enjoys traveling, hiking, biking and local restaurants and concerts. Dr. Stanley was born in Northern California and received his Bachelor of Science in Natural Resources and Wildlife Science from Cornell University in 1992. He graduated from the University of Pennsylvania School of Veterinary Medicine in 1997 and completed the Veterinary Acupuncture program at the Chi Institute in 2007. Dr. Stanley offers our clients an option of acupuncture and traditional Chinese herbal medicine. 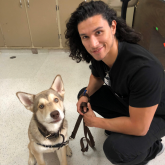 He loves working with dogs and cats, but also has a special interest and is skilled in treating companion exotic pets, especially reptiles. He shares his home with his wife, their two beautiful children and 'Bodhi', their loyal terrier. Dr. Stanley owns his business 'House Call of the Wild' but regularly sees patients here at Balboa as well. Dr. Amy Allen received her B.S. in Biological Sciences from Stanford University and her Doctor of Veterinary medicine from UC Davis. She completed an internship and residency in Internal Medicine. Dr. Allen performs in-house endoscopic procedures, which include foreign body retrieval and biopsies or sampling from upper and lower GI, rhinoscopy, nasopharyngoscopy, laryngoscopy, bronchoscopy, vaginoscopy and cystoscopy. Dr. Wells is available for specialty surgeries here at Balboa Pet Hospital. This allows us, your pet’s primary care veterinarian, to remain an integral part of the treatment team and makes follow-up care much more convenient. Surgeries include orthopedic and oncologic procedures. Dr. Wells also has a special interest in techniques that are minimally invasive (arthroscopy/laparoscopy / thoracoscopy), joint replacement and reconstructive procedures. Dr. Wells received his Doctorate of Veterinary Medicine upon graduation from UC Davis, and he is a Board-Certified Diplomate of the American College of Veterinary Surgeons. 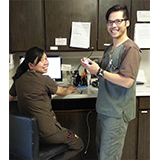 The Balboa Pet Hospital's team consists of Managers, Client Service Representatives, Registered Veterinary Technicians (RVT), Veterinary Assistants, and Kennel Attendants. 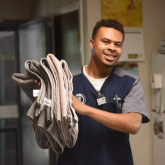 Vivian (Supervisor), Noelle (Supervisor), Jeff (Supervisor), Paula, Milvia, Laura, David, Kaya, Helen, Elder, Cindy, Everett, Lis & Jazmine are here to serve you and to assist our doctors with the care and well-being of your furry family member. We are proud of each and every one of them and their dedication to you, your pets and our business! All of our staff members are experienced and highly trained, and Vivian, Jeff, and Laura are RVTs licensed by the State of California. Alice has been a part of the Balboa Pet Hospital for as long as Dr. Clary has owned it. She raised four children before becoming the Practice Manager, in addition to doing whatever needed to be done to keep things running every day! She thoroughly enjoys our clients and their pets and feels it is very important to keep the family feeling to the practice. Alice grew up on a sheep ranch in Northern California, so working with animals has been a part of her life forever! She and Dr. Clary had many pets over the years, even a baby lamb 'Love' for a bit when its mother refused to nurse it! She adores her cat, Pete, who keeps her company at home, purring loudly and following her around the house. She has a gift for making clients feel at ease and welcome. If you have questions or concerns, she welcomes your calls. 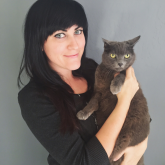 Alice's goal is to ensure you and your pet have an excellent experience at Balboa Pet Hospital. Colleen is Dr. Clary and Alice's daughter. Besides having worked at Balboa Pet Hospital while growing up, she has been the Balboa Pet Hospital CPA for more than 20 years. Colleen helps Alice with office duties. Colleen graduated from San Jose State University with a degree in Business Administration with an emphasis in Accounting. She has four children. She has a lifelong love of animals, and currently has a little terrier named Teddy and two cats named Rory, and Jonathan. She has passed her love of animals on to her children. Her daughter, Kyra, has a sweet terrier named Bill. Colleen enjoys an active lifestyle. She enjoys baseball and helping with her son's team.